The general concept to receive DRM transmissions. Keep the ground of the receiver and computer apart. 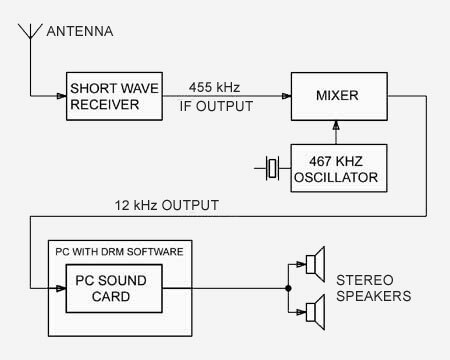 Use a transformer in the 12 kHz feed to the PC. A switched Power Supply can be a source of severe disturbance. Always run the power supply connected to an AC socket with earth. Small power supplies with a diode bridge inside can be a source of buzzing noise too. If you can, open them and connect 0.01 uF across each of the two or four diodes. Try to connect the receiver to ground if possible.